The English Mastiff is a breed of extremely large dog (often known simply as the Mastiff) perhaps descended from the ancient Alauntand Pugnaces Britanniae, with a significant input from the Alpine Mastiff in the 19th century. Distinguishable by enormous size, massive head, short coat in a limited range of colours, but always displaying a black mask, the Mastiff is noted for its gentle and loving nature. The lineage of modern dogs can be traced back to the early 19th century, but the modern type was stabilised in the 1880s and refined since. Following a period of sharp decline, the Mastiff has increased its worldwide popularity. 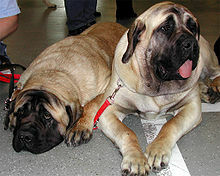 Throughout its history, the Mastiff has contributed to the development of a number of dog breeds, some generally known as Mastiff-type dogs, or, confusingly, just as "Mastiffs"
With a massive body, broad skull and head of generally square appearance, it is the largest dog breed in terms of mass. It is on average slightly heavier than the Saint Bernard, although there is a considerable mass overlap between these two breeds. Though the Irish Wolfhound and Great Dane can be more than six inches taller, they are not nearly as robust. The body is large with great depth and breadth, especially between the forelegs, causing these to be set wide apart. The length of the body taken from the point of the shoulder to the point of the buttock is greater than the height at the withers. The AKC standard height (per their website) for this breed is 30 inches (76 cm) at the shoulder for males and 27.5 inches (70 cm) (minimum) at the shoulder for females. A typical male can weigh 150–250 pounds (68–113 kg), a typical female can weigh 120–200 pounds (54–91 kg), with very large individuals reaching 130 kg (286 lb) or more. The former standard specified the coat should be short and close-lying. Long haired Mastiffs, called "Fluffies", are occasionally seen, due to a recessive gene, but this trait is not accepted by any kennel club. The colour is apricot-fawn, silver-fawn, fawn, or dark fawn-brindle, always with black on the muzzle, ears, and nose and around the eyes. The colours of the Mastiff coat are differently described by various kennel clubs, but are essentially fawn or apricot, or those colours as a base for black brindle. A black mask should occur in all cases. The fawn is generally a light "silver" shade, but may range up to a golden yellow. The apricot may be a slightly reddish hue up to a deep, rich red. The brindle markings should ideally be heavy, even and clear stripes, but may actually be light, uneven, patchy, faint or muddled. Pied Mastiffs occur rarely. Other non-standard colours include black, blue brindle, and chocolate (brown) mask. Some Mastiffs have a heavy shading caused by dark hairs throughout the coat or primarily on the back and shoulders. This is not generally considered a fault. Brindle is dominant over solid colour. Apricot is dominant over fawn, though that dominance may be incomplete. Most of the colour faults are recessive, though black is so rare in the Mastiff that it cannot be certain if it is recessive, or a mutation that is dominant.